Rabbi Arthur Schneier takes part in celebration commemorating fifty years of diplomatic relations between Israel and South Korea: Rabbi Arthur Schneier, President and founder of the Appeal of Conscience Foundation (right) joined Dr. Sang Jin Lee, South Korea�s First Vice Minister of Education, Science and Technology (left) and Tuvia Israeli, Israel�s Ambassador to the Republic of Korea (center) at the Israeli Embassy in Seoul, as South Korea and Israel celebrated fifty years of diplomatic relations. Both countries achieved independence in 1948. Israel, on May 15, 1948 and South Korea on August 15, 1948. 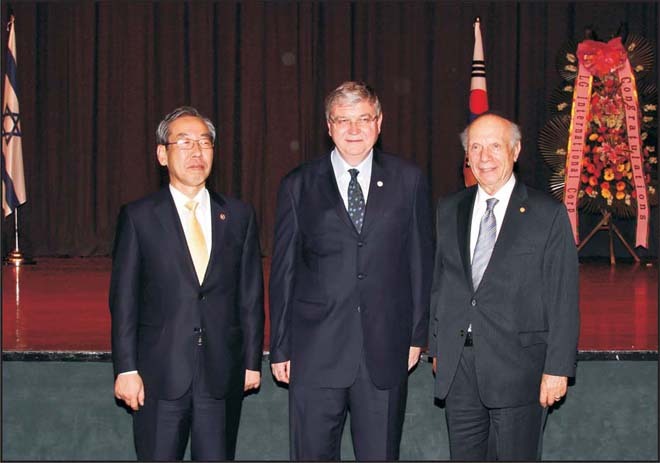 Rabbi Schneier visited South Korea at the invitation of President Lee Myung-bak. President Lee and First Lady, Kim Yoon-ok hosted Rabbi Schneier and his wife Elisabeth at a private luncheon in the Blue House in appreciation of Rabbi Schneier�s leadership to promote interfaith reconciliation, human rights, and tolerance. While in South Korea, Rabbi Schneier visited the DMZ and addressed hundreds of students at the prestigious Yonsei University in Seoul.